Our shipment has been delayed, it will now turn up on Tuesday, hopefully It was due to arrive yesterday, but when we did our alien registration Gregor’s photo was rejected, which has delayed everything. It is all in country, it just needs to clear customs, so now both the air and sea shipments will arrive together. I was told the sea shipment would take an additional three weeks so spent a few days sorting though our stuff to find the bits and pieces we wanted quickly. I know I should be pleased that everything is here but feel a bit miffed that I wasted so much time. Right, back to the point; Katrine and Gregor were very disappointed to not be getting their stuff. We only brought 4 suitcases with us, which is mostly clothes. Yesterday the weather wasn’t on our side, it was hot and very close so no one fancied going out. 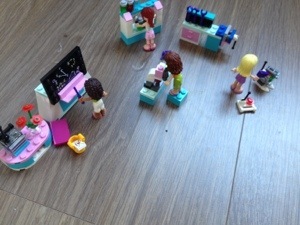 Instead we headed back to Emart and picked up some emergency Lego supplies. 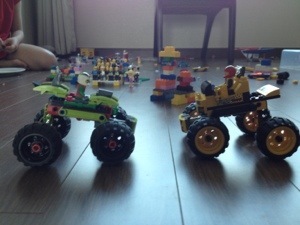 Gregor found these really cool monster trucks. 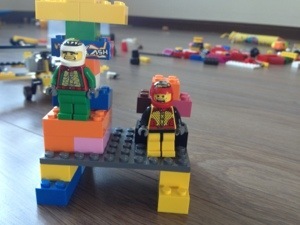 They are designed to crash into each other and the little Lego man gets catapulted out. 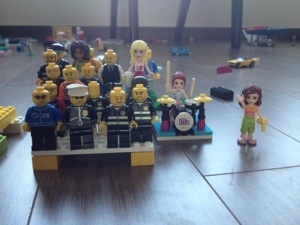 They had a competition watched by all the other Lego people. The green truck was declared the winner and awarded a trophy in a medal ceremony. 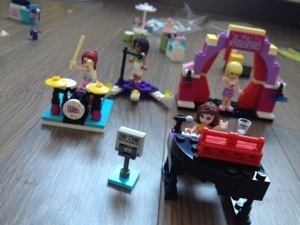 Katrine picked Lego Friends, the girls first put on a rockin’ concert for the post race party. Before heading back to the lab to get some work done.